jose agustin goytisolo 9-11, 08908 Hospitalet De Llobregat, Spanje. 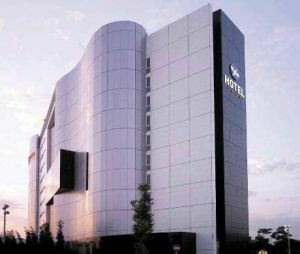 Elegant business hotel in Barcelona. The Fira Congres Hotel is an establishment of great category and cared design, perfect to spend your holidays, as well as for your business trips. It is situated inside an imposing Avant-garde building, in the new Gran Via business center, where you can quickly accede to any place of Barcelona from. The Fira Congres disposes of 167 large rooms, with a modern and elegant design, where the most important are the client's rest and contentment. The traveler will find in its rooms the most modern equipments, such as free Wi-Fi connection, satellite dish TV, mini bar, full Bathroom and an unending list of details. The Fira Congres Hotel also has rooms where you can celebrate any kind of events, seminaries, congresses or company reunions. And everything, in the new business center from Barcelona, at 9 km from the airport and 5 minutes from the fairground. A la carte restaurant, a modern spa-fitness and an exclusive Zeroom space are some of the modern facilities which complete the great offer of the Fira Congres.